Prime Minister Narendra Modi on Monday arrived in Davos to attend the World Economic Forum annual meet where he would share his vision for India’s future engagements with the international community. 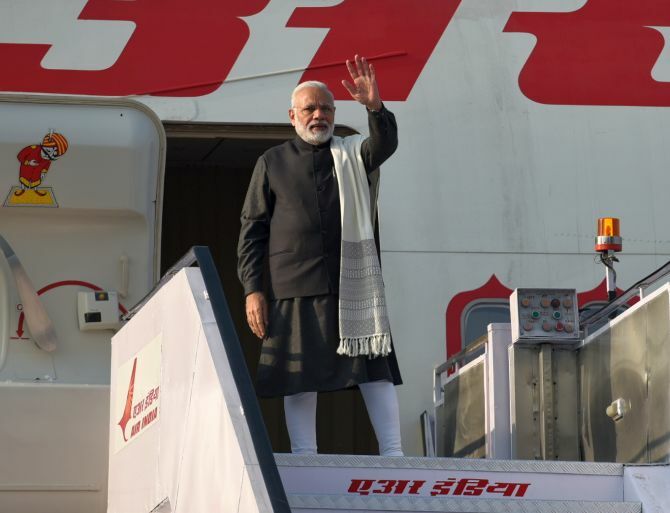 Modi, the first Indian prime minister to attend the summit in two decades, would deliver the opening plenary address at the summit on Tuesday. Apart from meeting Swiss President Alain Berset, he would also attend the welcome reception by India and later host a dinner for global CEOs. He is also scheduled to have a bilateral meeting with Swedish Prime Minister Stefan Lofven. On Tuesday, Modi would interact with global business community members, besides delivering his keynote address. The theme for this year’s summit is ‘Creating a Shared Future in a Fractured World’. In his departure statement on Sunday, the prime minister had said that India’s engagement with the outside world in the recent years has become “truly and effectively multi-dimensional covering the political, economic, people to people, security and other spheres”. “At Davos, I look forward to sharing my vision for India’s future engagement with the international community,” he had said. More than 3,000 world leaders from business, politics, art, academia and civil society would be attending the 48th WEF annual meeting, where the Indian presence would be the largest ever with over 130 participants. Modi is the first Indian prime minister to attend Davos meeting in about 20 years since H D Deve Gowda in 1997.